When I first started teaching kids with autism I searched everywhere for good picture books to explain it to kids. Let me tell you, it was not a successful trip to the book store! I finally found one...yep...ONE! That's it. That one was called Since We're Friends: An Autism Picture Book And I never found a really good one after that...until now! This week I was lucky enough to receive a digital copy of an adorable book picture book about autism! It's definitely a unique book that takes a whole new perspective. With the world becoming more aware of autism, it's time siblings and other children understand autism too! Leah's Voice is a very sweet story which does exactly that! I've searched high and low for good picture books about autism, and trust me, there aren't many! This one is very lovable for both the heartfelt illustrations and the caring set of characters. 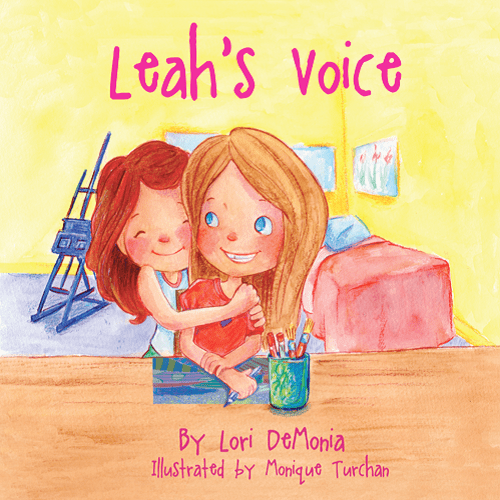 Leah's Voice gives real life examples that any child can relate to if they have been around a child with autism. The story is all about accepting the differences and including kids who are different, even if it means they need to play in different ways. The best part of this book is the story behind it! The author has two little girls, one of which has autism. Lori was kind enough to "virtually" interview her with a few questions. Tell us about your girls! Leah just celebrated her 12th birthday, and her younger sister, Sarah will be 9 in September. They have a great relationship. Sarah is a good role model for Leah and shows amazing patience with her. They ride the bus together, and both participated in an after school track program last year. They enjoy doing gymnastics and dancing together. For the first time Leah was able to have a birthday party and invited some of her girlfriends from school this summer. I didn't know what to expect, or how they would interact with Leah. I was overwhelmed with how kind and patient they were, and it was a dream come true that Leah have friends that truly care about her. How old was your daughter when you discovered she had autism? Around 18 months old we noticed she stopped responding to her name, and then began becoming agitated at times when we tried playing with her or got too close. Slight changes that we thought would subside didn't, and at age 2 1/2 she was diagnosed with autistic spectrum disorder. What inspired you to write this book? I saw a need for a book about a female character with autism, and a book that had a good story to capture children's attention as well. I was inspired by my daughter's relationship and how loving and patient Leah's younger sister is. Since it is a fictional story, I used the name Logan for the younger sister in the story. Do you intend to write more books about autism in the future? I hope to write a follow up story with the same characters possibly, or maybe boy characters. I'm currently writing an article about siblings and autism for a magazine. I saw that your daughter's artwork was in the newspaper. How did she get discovered for her artistic abilities? I found out about KindTree, an organization that does the Autism Rocks traveling art show, as well as other events with individuals on the spectrum. They have a yearly art grant award which is given to artists on the spectrum by a judged panel. I sent Leah's art to them one year and she received a grant and her art piece was included in the art show. Their artists are from the U.S. and other countries as well. The following year she was one of three artists to receive a grant. Now it has been 5 consecutive years! When she was very young it seemed taking out art supplies was the best way to re-direct her while she was having a meltdown. Then a friend made a comment that her art was very advanced for her age, and I began to save much of her artwork. To this day it is something she enjoys, and she shares what's in her heart through her artwork too. When did you explain autism to the girls? We told Sarah about her sister's autism when she was about 4 1/2. I don't think she fully understood what it was until she was a little older. Leah has been told she has autism, but if asked she probably couldn't explain it. What recommendations do you have to other parents of children with autism? Try to surround yourself with a good support system. Don't let any negative comments about your child bring you down. I used to get very upset about hurtful comments and now realize they most of the time are out of ignorance. That's not to say they aren't hurtful, but don't let them take away your hope and positive outlook. Trying not to put too much thought into all the things your child may not do, and focus on their strengths is something I would also recommend. Find joy in the small accomplishments too. One day Leah left the house to catch the bus. While walking with her dad and sister, she stopped in her tracks, went back to the house and opened the door to say "goodbye mom!". That moment meant so much to me, even though millions of moms out there hear those words daily before school,to me it was a huge deal! Plus, it was unprompted and out of love. Stay hopeful no matter how small the accomplishment. I wish more people would understand how different the world we experience is to an individual with autism. Sounds that can't be filtered out or sensations that we can easily cope with, sometimes can be painful for someone with autism or so distracting that it hinders everything. If more people understood that their behavior is at times their way of coping with things, I think there would be more acceptance. Thanks for reading! What is your favorite book about autism?